Planning an online chat, conference call or videoconference with participants in Chile - Easter Island and around the globe can be difficult, especially when you need to find a time in the day when everyone is in their business hours! This world meeting planner allows you to choose the date for your meeting and the locations (including Chile - Easter Island) of the people attending. Your world meeting planner results allow you to see the relationship each location has in regards to daytime hours with proper adjustments for any locations observing daylight saving time, so you can quickly target a time that works for everyone. Please Note! 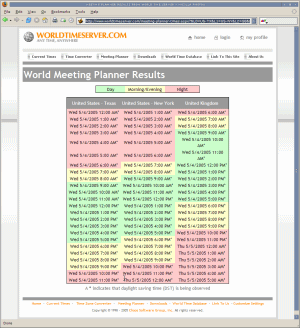 This world meeting planner can only predict times using the current known information about each location's time rules. If you are checking a date far into the future, be sure to check back again later to make sure that a location for your meeting has not made additional changes to their time zone rules between now and the event date! Select up to eight locations (including Chile - Easter Island) where participants for your meeting or conference call are located. You can save your home location where you are and your other locations as favorites if you plan to use this site again in the future and would like to have your own list to pick from instead of our complete list of every location world-wide. Your World Meeting Planner results will have color-coding to make it easy to see at a glance when the best times to meet would be for all of the participants. If you see GREEN times for all your locations, you have found a good time to meet as everyone would be in daytime. On the other hand, any time with a RED color it would be night there and would not be a good time for your conference call or meeting. Once you have determined a good time to have your conference call, the results page provides you the local time for each location, so you can email each participant to invite them to your event and be able to tell them when they should attend in their own time, not yours, and make it easy for them to add it to their own schedule. Copyright © 1998 - 2015 WorldTimeServer.com All rights reserved. Executed in 0.017 seconds.